What pitch prop is on it? Is this motor still available? 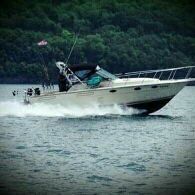 I have a 18’ Blue Fin aluminum boat with a 70Hp 2 stroke I’ve been using for trolling, been looking for a kicker. How is this not sold yet? Smoking deal.